The Big Dog World dog bib is made from high quality cotton to help keep your drooling dog clean when out on walks visiting friends or when preparing for dog shows. 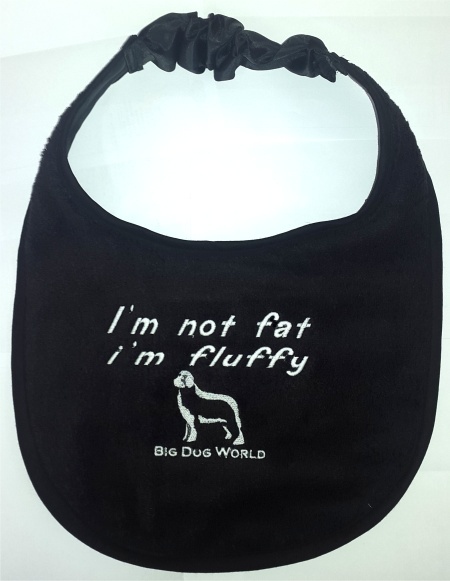 Embroidered with a choice of slogan and the famous Big Dog World logo. 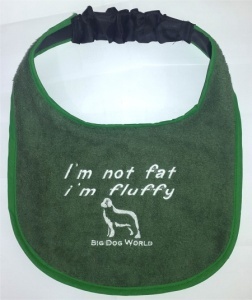 The dog bibs are made from absorbant cotton toweling and have a waterproof backing. Perfect for giant breed dogs such as Saint Bernards, Newfoundlands, Mastiffs and Great Danes. They have a durable elastic neckband which slips over the head and keeps the bib secure and are also waterproof to stop hairs from sticking.